Love the photos of your girls in their new frames, you'll be able to look at them and think of happy times, not be melancholy because that isn't allowed (well only very occasionally). Hope you are a bit less iffy - hoping to get to the shop before it all sells out! And the word verification is 'bless' - how patronizing is that?! Or perhaps it isn't in American? I feel quite put down, but maybe I should feel ennobled. what terrific finds. and you painted them in my favorite color. you are always so inventive or should i say re-inventive. From feeling iffy to feeling crafty, that's good! It's a very nice colour which you used for those pictureframes. The frames are delightful, I am looking, looking, looking for one similar to house a little birdie watercolour I bought off etsy. these are adorable and ooohh-so-creative!! 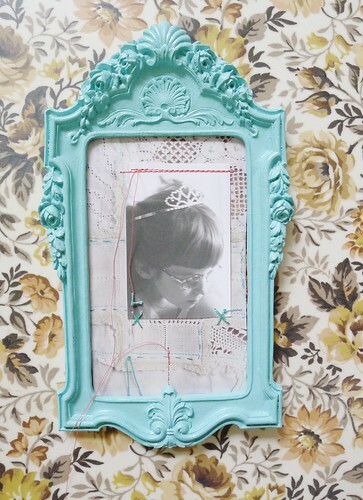 love the choice of turquoise, too - it really makes the frame pop while still being perfectly pretty. These are just beautiful. And it is so lovely to hear the story behind the pictures. Fabulous colour! I have painted Way too much of my home this shade- i fear it has become an obsession! Enjoy crafting this week, I hope you have a sunny spot to do it in! p.s How amazing are jane's display boxes?! One of my fave blogs right there! These are so sweet! 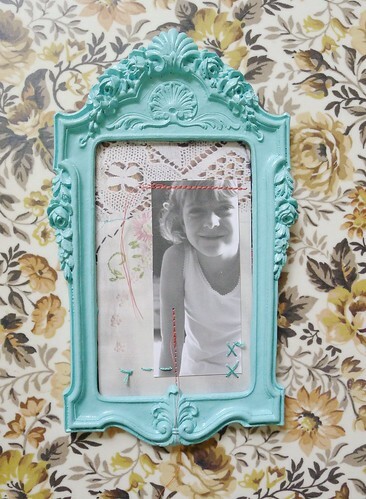 I am struggling with some little vintagey finds myself at the moment...your little frames have encouraged me to press on! :D You have also reminded me to take more photos of my little ones...no matter what they might be doing. Although I am impressed with your marvellous new frames, I am captivated - nay, enthralled - by your bunny lamp and your candelabra! 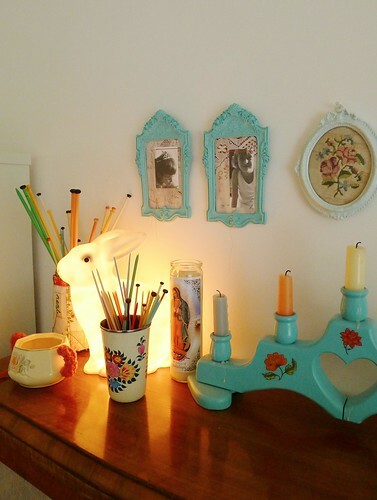 Where did you find the WONDERFUL bunny lamp? Your posts are so much fun :). Trisha! gosh i was not good at taking snap shots of my children and i do not have many at all from when they were little, even less of them as teens. it is my one regret that i did not take the time to get the camera out more often.